Significant structural alterations are planned for the first-ever Apple Store at Tysons Corner Center shopping mall in McLean, Virginia. It's the store where Steve Jobs presented Apple's entire retail concept shortly before it opened on May 19, 2001. While it's had minor facelifts since then, this would be its first major refit. Documents submitted by Apple to the Fairfax County Department of Planning and Zoning describe the work as "interior framing only" but call for permissions up to and including some demolition. No dates for the intended work are included or have been revealed. The documents as seen by AppleInsider do not suggest that multiple retail locations inside the mall will be consolidate into one, and are similar to those filed by Apple during the store's previous two renovations in-place. Retail real estate sources have also told us that for the immediate future, there are no multiple adjacent locations elsewhere in the mall able to be consolidated in the manner that Apple typically requires. Additionally, we were told that there aren't any large enough locations that will be available for at least 14 months to make a "flagship" store like the nearby Pentagon City mall store in Arlington, Virginia. Apple has been remodelling Stores around the world. In Birmingham, UK, the Apple Store saw minor but important improvements to accessibility with ramps being added to the entrance. Apple Wangfujing, the company's main Store in Beijing, was closed last month for the start of renovations. Tysons Corner, however, is the most significant of the Stores to face remodelling because while Apple also opened a Store in Glendale, California, time zone differences mean this was officially the first. Apple Stores were not expected to be a success but between the Tysons Corner and Glendale Stores, Apple saw almost 8,000 visitors and sold just under $600,000 of goods in their first weekend. MacRumors, which first obtained the planning documents, claims that sources are saying the Store may relocate to another part of Tysons Corner Center. 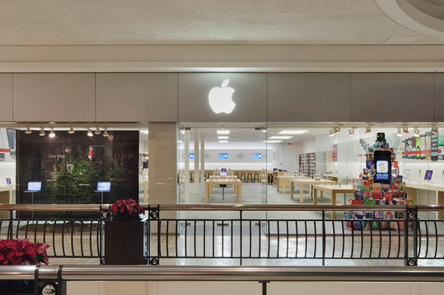 It appears that the relocation may refer to a temporary store while Apple finishes renovations.